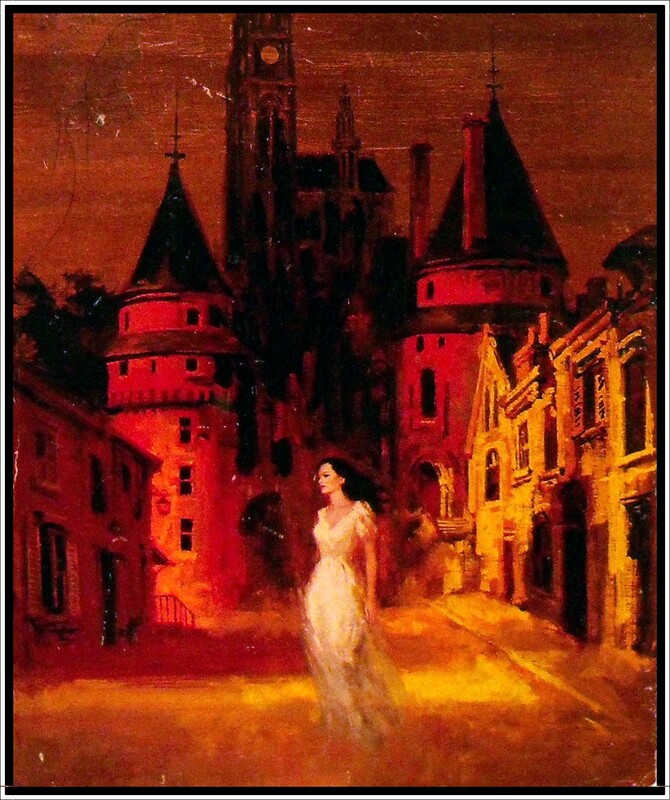 Chateau of Secrets was the very first gothic I reviewed on this blog. It’s a short, enjoyable romp following the misadventures of Ann Preston who travels to France and finds herself enmeshed in her own chateau of secrets, along with some very peculiar characters. My original ramblings can be read HERE. Published by Five Star, this is one of my favourite covers. The artwork is different from most in this genre and at the time I posted the review, apart from a backwards signature just visible under the subject’s right arm, I had no idea who the artist was. So it was a lovely surprise when Lynn Munroe emailed me with a link to his new spring catalogue, detailing the work of artist Tom Miller. 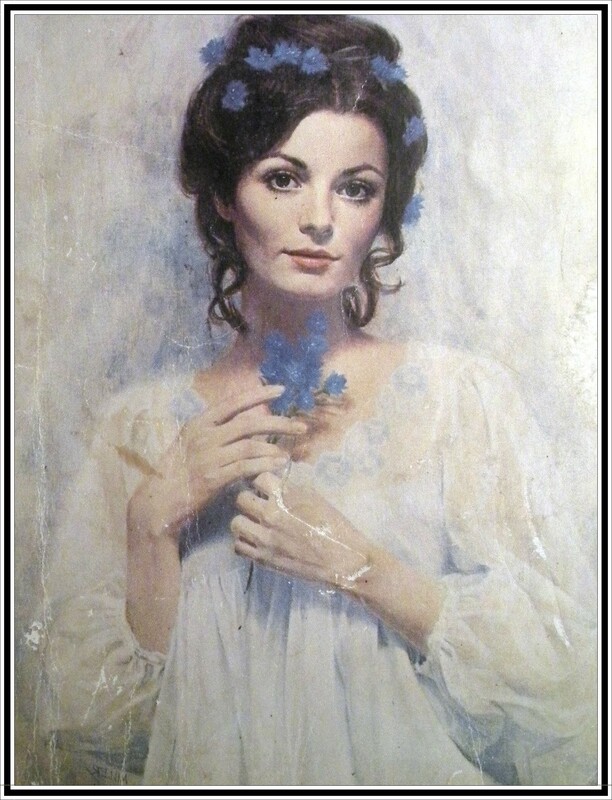 Lynn’s comprehensive biography and checklist includes a scan of the same portrait used for Chateau of Secrets gracing another cover – a Fawcett Crest publication of Vladimir Nabokov’s Mary. You can see Miller’s artwork was flipped in the Five Star edition (hence the backward signature). It’s always a thrill when I come across a favourite cover being used on an unfamiliar book. Comparing the two, I think the change of perspective subtly alters her expression and that she looks more pensive on the gothic. What do you think? The two covers can be seen together HERE along with a biography and more fine examples of Tom Miller’s work HERE. Paris! Anita could not believe it. Her every dream had been of the glories of the City of Light, and now, thanks to aunt Emily’s legacy, she was really here. Anita had one goal: becoming a successful artist. And what better place to study art than in the world capital of art? When Alexis Binaud agreed to accept her as a student, she was ecstatic… but her idol soon proved himself nothing more than a man. And Anita found she had opened the door to a dark secret… and that door was closing, locking her prisoner in a private hell! This edition published by Zenith Publications, London. (No date). It’s been awhile since my last post, I know… so thanks to everyone who has stopped by and left comments & emails – I promise to start replying soon! Bear with me as my beleaguered brain relearns its way around WordPress – I have been doing things the old fashioned way these past few months and am slowly refamiliarising myself with the internet. 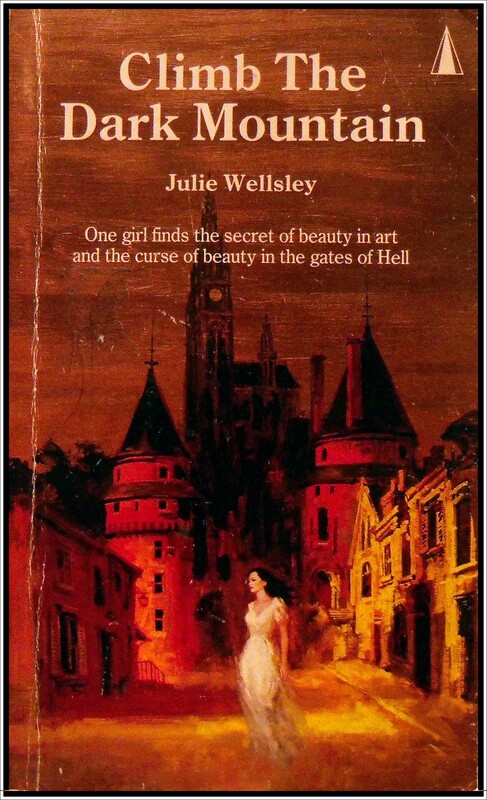 Having reviewed a couple of Julie Wellsley novels on this site before – House Malign and Chateau of Secrets – I thought Climb the Dark Mountain would be a good book to start the summer off with since it’s been lurking on my to-read pile for ages. The story starts when Anita Morris inherits some money and uses it to fulfil her long time ambition of becoming an artist. Thanks to a small legacy left to her in her aunt’s will, she now has enough cash to fly to Paris and study under the tutelage of renowned painter Alexis Binaud. Montmartre is a long, long way from Maida Vale and everything Anita imagined it would be – all cutting edge glamour crossed with bohemian insouciance. As for Alexis, well, if drinking Pernod and chain-smoking Gitanes didn’t single him out as a genius, his moody charm and ruggedly handsome good looks sure do – so it’s no wonder Anita has fallen helplessly in love by the end of chapter 3. When Alexis offers her a part time job illustrating a cartoon strip he is creating for a local paper, she jumps at the chance of spending more time with him. There is one slight catch however – for a mysterious fire at the art school means Anita will now be living and working from the artist’s home. And it’s not just any old house. Alexis lives with his mother in an old French chateau with a dark past. Occupied by the Gestapo during the war, it is a place impregnated with evil, haunted by the ghosts of prisoners of war who were tortured and buried in its dungeons. Fast-paced, action-packed, Climb the Dark Mountain was a lot of fun crammed with whole heaps of gothicness – including eerily painted murals with eyes that follow you in the dark, an artist’s incestuous love for his dead sister, Nazis, secret rooms, madness, murder and much, much, more – I really sensed Julie Wellsley must have had a lot of fun writing this one. But with so much going on, I found the story did get a little convoluted at times – with a confusing subplot about a spy ring or criminal gang that did not make sense to me at all – although that could be because I was far too engrossed with Alexis’ tortured love for his embalmed sibling to take much notice of other such minor fripperies. Three out of four stars, with bonus points for this lovely cover which could have been painted by Alexis Binaud himself! “Heartbeats…. If she ever married she would marry someone like Steve Martin, the young writer she had bumped into at the airport – dark, good-looking, with smiling eyes and a sense of humour. She would have good cause to cherish his name. Ann Preston arrived at Chateau Duval – a house that had known only tears and heartbreak – a house that had died. Almost immediately she was plunged into a nightmare world of dark secrets. 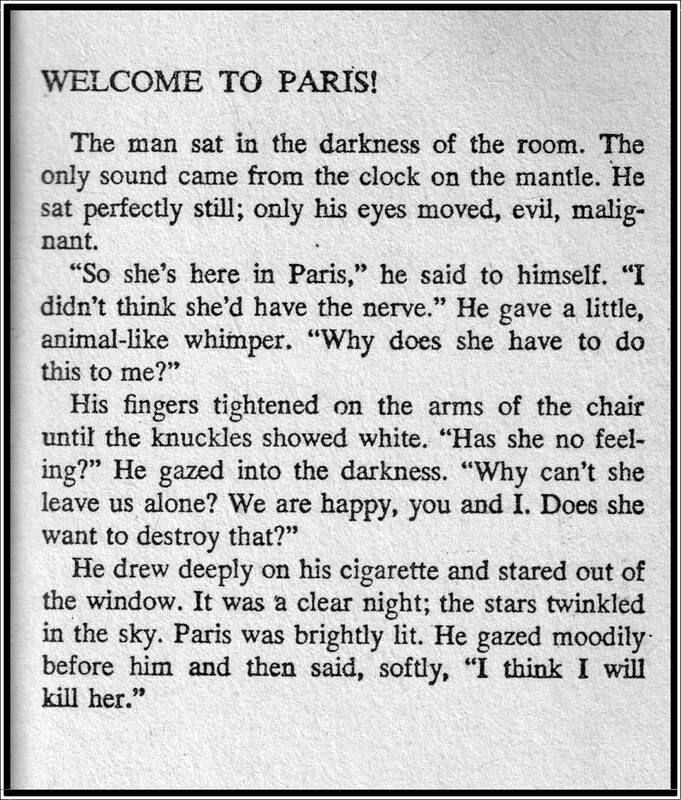 Pierre Duval, the ex-trapeze artist…Juliette, his wife, who keeps a snake for a pet… Yvette, the beautiful daughter, in love with Steve and determined to get her own way….the pungent smell of lilies of the valley and dead leaves coupled with shrill maniacal laughter…. 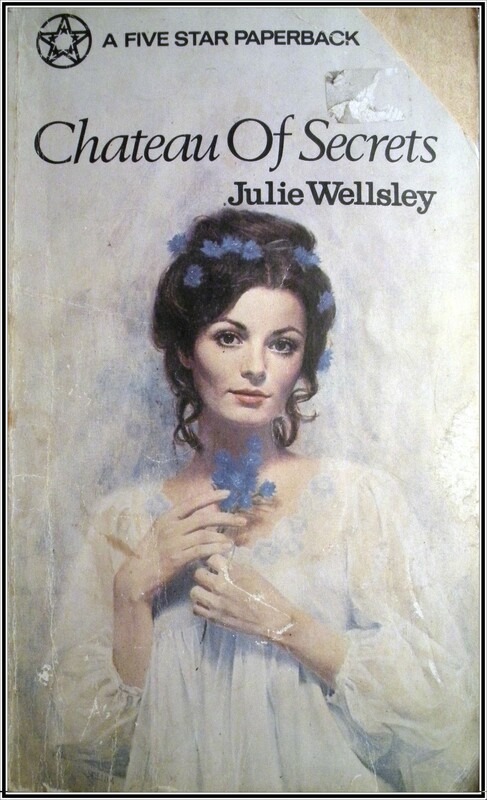 Written by Julie Wellsley and published 1972 by Five Star paperback. Our heroine, Ann Preston, has accepted a live-in job as a secretary with the sinister Duval family in France and has ended up with a little more than a delusional boss and a pile of paperwork to deal with. Someone or something is trying to kill her and, though a range of suspects present themselves early on, the who’s and why’s kept me guessing till (nearly) the end. This is a nicely paced novel with an interesting mix of characters – I particularly liked the embittered and twisted old matriarch, Juliette, who spent most her time hobbling away in the shadows, crooning sweet nothings to her beloved pet python. Unfortunately there are no supernatural elements but there are still plenty of gothic touches to add atmosphere – including derangement, disfigurement, a crumbly big house and the odd murder or two. Of course it all ends happy ever after but the romance is kept low key and out of the way of the mystery. 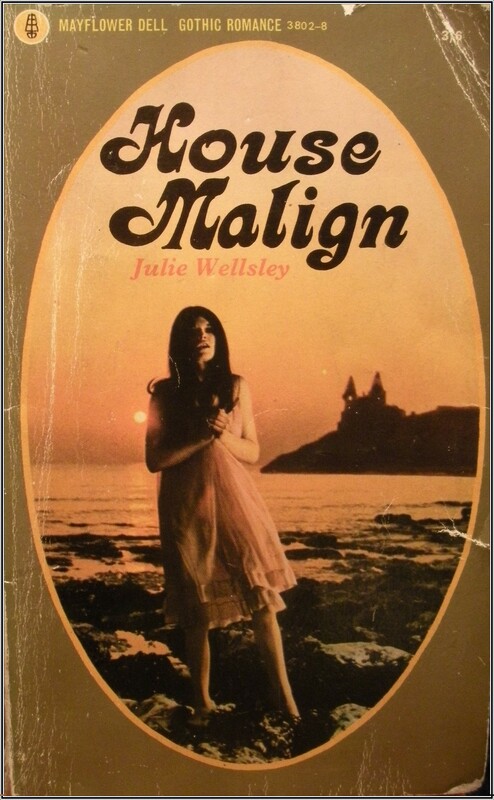 The cover art is atypical to most from this genre, having neither the gloomy, doomy colour scheme nor the scary house in the background, but is beautifully done and alluring nonetheless. If you look closely you can see a backward signature under her right arm which looks like the name ‘Miller’. 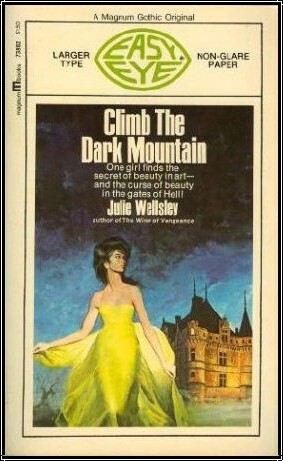 Other books written by Julie Wellsley include Climb the Dark Mountan and Tall, Dark Stranger. Three out of five stars.